The town of Monkton has selected a town flag to be dedicated on the town’s 250th anniversary this summer. The winning design was created by Mount Abraham Union High School art teacher Linda Reynolds. 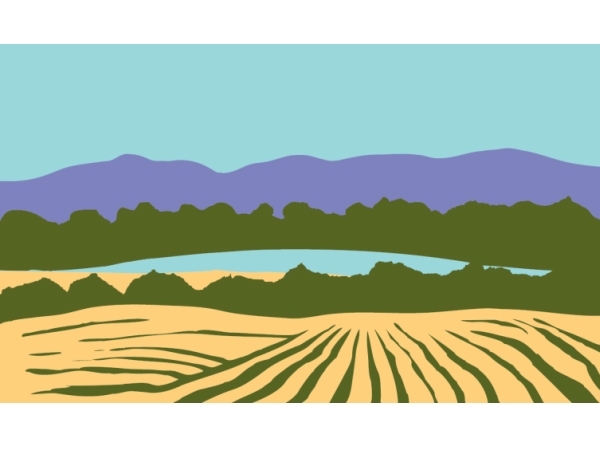 It depicts farm fields, mountains and ponds. Reynold’s design was the first choice for 70 percent of the voters, and was in the top three for 89 percent of those who chose to vote. The flag was not part of the official Town Meeting Day ballot, but two-thirds of residents still weighed in. People in Monkton will be able to order their own town flag for the anniversary celebration on June 24th, and the design will also be turned into a postmark for that day. On this Town Meeting Day, voters in one Addison County town have reiterated their strong opposition to a proposed natural gas pipeline, hoping to boost their voice as the Vermont Gas Company seeks permission from the state to expand its service south. A legislative delegation from Addison County is responding to the town of Monkton’s opposition to the proposed route for a natural gas pipeline extension.